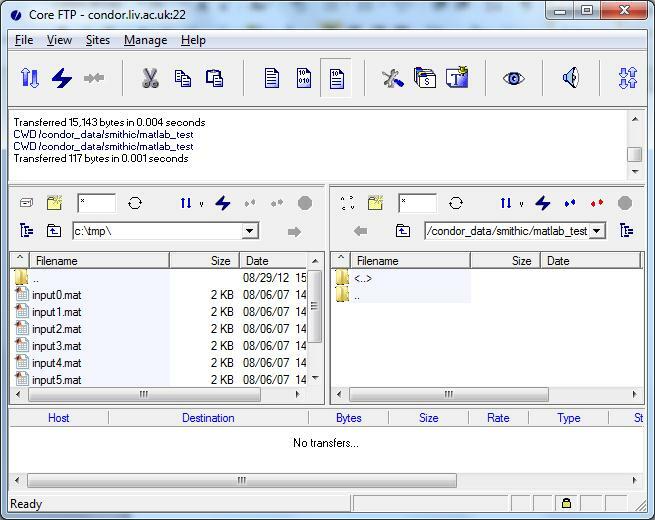 In the interests of security, access to the Condor server and HPC clusters such as chadwick is restricted to registered users and the way in which these services are accessed will depend on whether users are connected to the campus network directly or working remotely off-campus. Users have a choice of client applications which can be used to login to the services and to transfer files to/from them. The choice of which to use is really down to personal taste and experience. MobaXterm is a very versatile graphical application which can be used to login to remote services and to upload/download files. One its main advantages is that it can act as an X Windows server allowing the users to run graphical Windows-type interfaces to applications. The multitude of features provided by MobaXterm may be off putting to beginners and it can be replaced by a pair of simpler applications - namely PuTTY for loging in to services and CoreFTPlite for transferring files. Another alternative for users who already work in a command line UNIX environment is the built-in ssh and scp commands for loging in and file transfer respectively. All of the above clients can be used either on or off-campus however for off campus access you will need to employ an additional tool to allow you to "get through" the campus firewall - this is because we do not allow direct access from off site to Condor or chadwick for security reasons. This is provided by the CSD Virtual Private Network (VPN). An alternative is to use AppsAnywhere however this will not allow you transfer files - only to login. The easiest way to login to Condor or other servers when using the MWS is via the PuTTY terminal client. If this is not already present on the desktop, it can be installed from the Install University Applications shortcut. Select Internet from the list of Categories and PuTTY 0.60 from the list of Applications. When you are finished with your login session type exit at the command line prompt to logout. 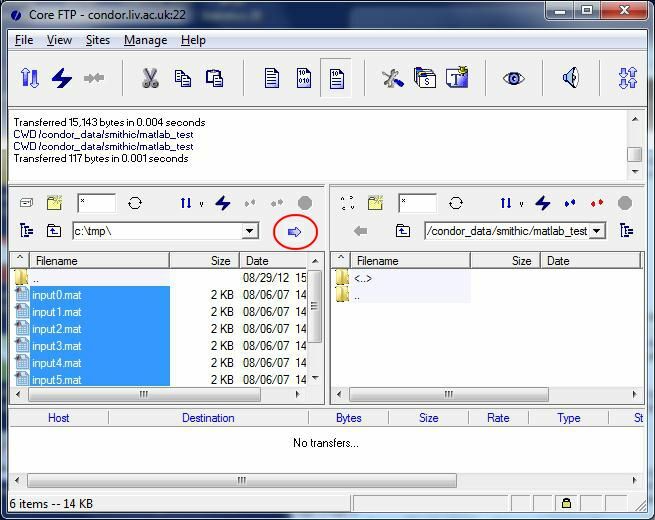 The simplest way to transfer files to and from a server is to use the CoreFTPLite client. Unfortunately this seems to have disappeared from Install University Apps, however it can be downloaded and installed from http://www.coreftp.com/download.html. Files on the desktop PC will appear in the left hand pane and those on the server on the right. To transfer files, navigate to the directory/folder containing the files you want to move. In the example shown below files are uploaded from c:\tmp on the PC to /condor_data/smithic/matlab_test on the Condor server. Instead of using the arrow icons, files can be transferred by dragging from one pane to the other. Files can be downloaded by a similar method to uploading. then enter your chadwick username and password. Once connected, you can transfer files using normal sftp commands (see standard Linux documentation for details). 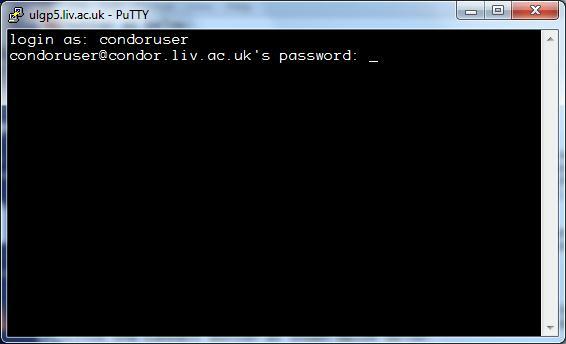 The same commands can be used for Condor with condor.liv.ac.uk as the host name. Users of Apple and Linux-based laptops should follow the instructions given above. It is possible to access ARC services from outside the University network however unsecured connections made directly to the machines such as Condor or chadwick are prohibited for security reasons. This makes off-campus access trickier than local access. In practise, a connection first needs to be made to another server on the campus network or, alternatively, a secure (so-called "tunnelled") connection needs to be made to the required service (e.g. Condor or chadwick) via the University virtual private network. Then start PuTTY from the Utilities group and login as you would using the MWS (see above). Before connecting using Core FTP Lite or MobaXterm, you will first need to start the VPN client. Once this is working you can connect to the Condor or chadwick etc with Core FTP Lite as you would when logged in locally via the MWS (see above). If you are using a Linux or Mac-based machine from off-campus, then you can still access ARC servers by first installing the VPN client and then using ssh or sftp from a terminal window as described above. To download files use the same process but in reverse. The standard UNIX documentation gives details on how to use scp. Please delete any files from /tmp after use. If you have a large amount of input and/or output files to transfer between your PC and a server, then selecting each one with Core FTP Lite can be cumbersome and prone to error. Here it is much easier to bundle the files together into a ZIP format file which can be uploaded or downloaded in one action. A similar method can be used to upload the input files. First copy the input files to an empty folder on the PC. Then right-click on the folder name and select Send To | Compressed (zipped) folder and enter the ZIP file name. After uploading the ZIP format file the individual files can be extracted with the unzip command e.g.